Fitments for Valkyrie, Goldwing GL1800, V-Rod and more. Today, Avon's century of tyre-making experience is combined with the very latest design and manufacturing technology. Add in a punishing test regime and you can see why Avon makes tyres of unparalleled quality and ability. So if you're after tyres that can confidently shrug off the elements, tyres that help make driving a pleasure rather than a chore, ask for Avon. 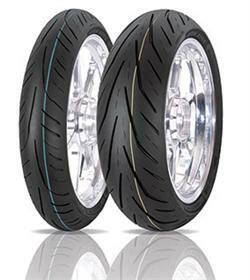 WCTA - Wide Custom Tread Arc - is Avon new tyre profile that gives Cobra a nimble characteristic once reserved only for agile race-bred bikes, all without disrupting all-important stability. The Avon Storm-ST replaces Avon's Azaro-ST and builds on its predecessor's talents. Employing what's called 'Reactive Footprint' (RF) technology, the Storm-ST produces a footprint that changes size and shape depending on the bike's lean angle, growing in size the further over the bike goes. It means you get high grip through the corners yet in a straight line have a footprint which increases the Storm-STs lifespan. Avon RF Technology is a quantum leap in technology from the dual compound tread, and will provide unparalleled evenness in wear patterns. The wet weather performance of the Storm-ST is outstanding. 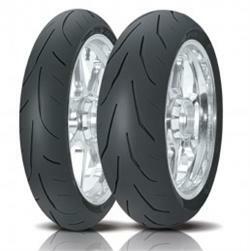 The extremely high silica content delivers optimum grip in the wet and dry. It also has the added benefit of warming up quickly. 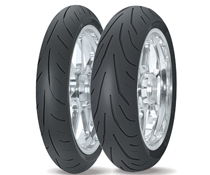 On the front tyres, the Storm-ST benefits from Inverted Front Grooves (IFG) that resist stepped-wear and cupping, ensuring smooth handling for the life of the tyre and improving wet weather braking. With all this (together with many other unique-to Avon technologies) it's no wonder the Storm-ST has gained numerous approvals from the tough German testing organisation, the TUV.